We offer accessible trains, buses, as well as stations and stops to ensure you can travel with us either independently or with a support person. Use the ramped mini-platform on the train platform. 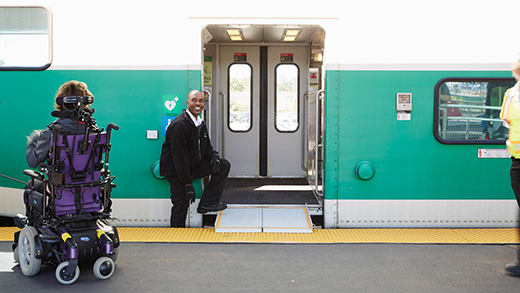 The Customer Service Ambassador will place a ramp between the train door and the mini-platform for boarding and exiting. Lock your brakes and turn off your device once you're in position on the train. Use straps to secure your wheelchair or mobility aid if you wish, for your safety and comfort. Please note that accessibility coaches have securement areas of 152 cm long and 90 cm wide, an aisle clearance of 81 cm and a ramp weight capacity of 272 kg. All GO bus routes are accessible for people using wheeled mobility aids, but not all bus stops are accessible. Find a station or stop to learn which stations and stops are accessible. Get into position, lock your brakes, and turn your device off. For everyone’s safety, the driver must secure your wheelchair or scooter with the straps on the bus. If using a scooter, transfer to a seat on the bus immediately in front of or behind your scooter. Sitting on a scooter is not safe when the bus is moving. If you’re under 16 years of age you’re required to wear both shoulder and lap belts. The driver can help fasten them if needed. High floor highway buses have two securement areas of 127 cm in length, 76 cm in width, and an aisle width of 54 cm; the lift is raised to a height of 137 cm and weight capacity is 340 kg. Double decker buses have two securement areas ranging from 129 to 151 cm in length, 80 cm in width, and an aisle width of 85 cm. The access ramp is 81 cm wide with a maximum weight capacity of 318 kg. Find a station or stop to learn which stations and stops are accessible.